Industrialist Shravan Ram’s wife Sudha is murdered. Detective Chatur Nath is assigned the case. Shravan’s family is his prime suspect, he investigates his family members first. While investigating Shravan, he gets a phone call. When Chatur reached the given address, he saw what he hadn’t expected to see – a small dilapidated house with fading paint. The bricks were escaping from the lot. The house screamed “I need renovation”. “Just like the streak of grey in your hair, I was wondering if you have shades of grey as well”, Chatur said sarcastically, after introducing himself. “No sir. Madam won’t bring anyone home. Even business partners. I have never seen a friend of her in my service.” Chatur nodded, though he was a bit shocked and disappointed. “Now, can you recollect any quarrels between the family members that you watchmen love to eavesdrop?” Chatur quipped. “I don’t listen to anything of that sort, sir” Rajaram looked offended. “Are you sure ?Speak up”. He persisted. Chatur knew something big was coming. Rajaram, after deep thinking, spoke up hesitantly “About 2 weeks ago, Sudha madam had a spat with Mythili madam. It was initially verbal, but later became physical when Sudha madam pushed her out of the house”. “Are you aware of any other incidents like these?” Chatur seemed to be apathetic about his lamentations. When he left the house, Chatur thought to himself, “He’s a good watchman, after all” and smiled to himself. “Mr Chatur Nath, please don’t disturb me now. I myself am in grief” Mythili said, pathetically holding her head. Her in laws were not at home. Chatur grinned. ”We have our sources, ma’am. Now answer my question”, he said suddenly changing the tone of his voice. There was a tear or two flowing from Mythili’s eyes. After few seconds, she started talking “Yes, it’s true. I used to borrow money from Shravan for emergencies. Sudha did not like it one bit. But, Shravan didn’t mind giving me money and so I didn’t stop getting it. That particular day, Shravan was not there. Sudha knew why I had come. She insulted me and pushed me out of the house. Such arrogance!” She gritted her teeth. “And the only way to control this arrogance is murder, right, Mrs. Mythili?” Chatur asked, raising his voice. “No sir. I didn’t do this” she shook her head too fast and dramatically. Chatur didn’t seem to be convinced. His cold stare was burning her. She broke down. “Believe me sir… I didn’t do” she said in between her sobs. Though Chatur didn’t believe her, he couldn’t proceed due to lack of evidence. He warned her not to leave the town till the case was open and left her to cry alone. Chatur wanted to inspect the murder scene another time. His intuition had told him that there was something in that house; something he had missed. The sun was upright. With no people and houses around, the desolated street looked like it was haunted. He entered the house guarded by the constables and went around the living room which had the chalk mark of the dead. He couldn’t find anything in the living room. He opened the door to the backyard. He decided to venture into the thorny bushes which he had avoided the previous day. He searched throughly in between the bushes. The dried and shrunken wastes of vegetables and fruits were scattered in the bushes. It was essentially an organic garbage dump. Suddenly, his eyes spotted something. His lips broke into a smile. 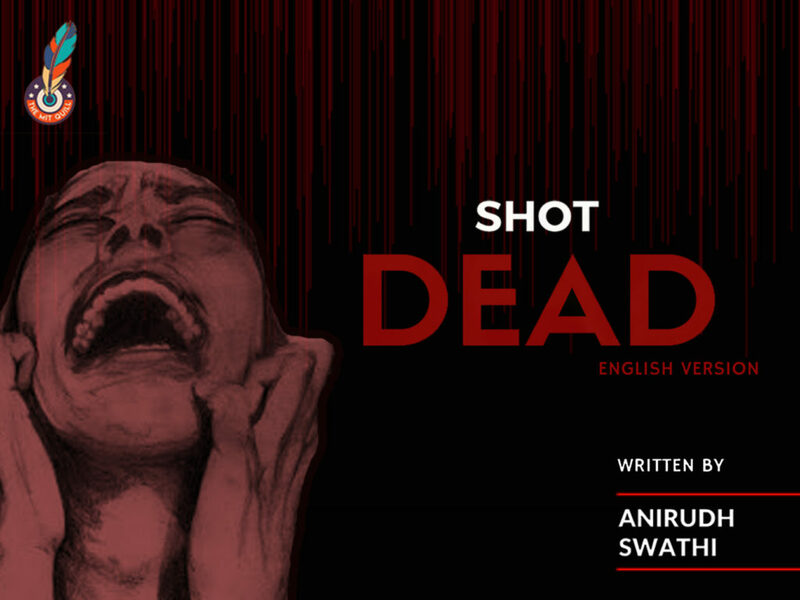 Shot dead – is an exclusive bilingual crime novel series, jointly written by Swathi Mohan and Anirudh Ramesh (English) and Arun Balaji, Kishore and K.Pavithra (Tamil).